Did the Coconut Palm originate in the Americas? Was it in the Cook Islands when the first Polynesians arrived? 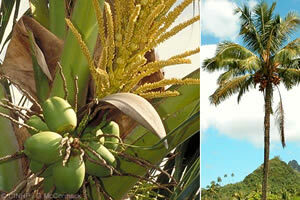 The first Western record of Coconut Palms was in 545AD by Cosmos, an Egyptian, who saw them in India and Sri Lanka. Other reports followed, and Marco Polo reported them in Indonesia in 1280. The Portuguese Vasco de Gama discovered the route around Africa to India in 1498. He did not find Coconut Palms on the Atlantic coast of Africa nor in southern Africa. His first record of ‘coquos’ was at Malindi in Kenya. On this way home he left coconuts at Cape Verde, the first in the Atlantic. In the 1490s Columbus erroneously reported Coconut Palms in the Caribbean. It is now concluded that Diego Corenco, a former pastor of Cape Verde, introduced the first coconuts into the Caribbean to Puerto Rico in 1549. A recent re-evaluation of early Spanish records has concluded that coconuts were pre-Spanish on the Pacific coasts of Costa Rica, Panama and northern Colombia. The writers concluded that coconuts had reached America naturally by floating or they may have been carried by ancient voyagers. Harries (1990) concluded that the Coconut Palm originated in the Malay-Indonesia area and dispersed on the sea to colonise islands and shores in the Indian and Pacific Oceans. In 1995 a fossil coconut fruit was reported in southern Queensland, which showed that the Coconut Palm has been around for at least two million years. Two million years is ample time for a widespread dispersal as proposed by Harries. The Cook Islands contribution to the debate is very significant. During the 1990s Coconut Palm pollen was found in lake sediments on Atiu dated at 6,600BC, and in the lake sediments on Mangaia at 5,300BC. The earliest direct evidence of Polynesian settlement in the southern Cook Islands is from Rarotonga on Motu Tapu at around 900AD, with other islands a little later. The earliest indirect evidence of human activity is on Mangaia at 500BC and on Atiu at 600AD. It is obvious that the Coconut Palm pollen of Atiu and Mangaia greatly pre-dates settlement by people, and this indicates that this palm is native in the Cook Islands. The Niu Kafa fruit is angular, ovoid, thick husked, thin fleshed, and late sprouting. These features favour dispersal by floating on the ocean and this was the native Coconut Palm of Indonesia, the Indian and Pacific Oceans. The Niu Vai fruit is near-spherical, thin husked, thick fleshed, and early sprouting. It was developed in southeast Asia or Indonesia to provide drink and food, and it was varieties of Niu Vai that were dispersed by people, including the early Polynesians. The story of ‘Ina and Tuna, the eel-God, is one of the most common Polynesian legends on the origin of the Coconut Palm. An account recorded in the 1870s on Mangaia has ‘Ina-moe-Aitu (‘Ina-with-the-divine-lover) as a beautiful young woman living near a cave near Tamarua village. She bathed in a stream that flowed into the cave, and she was sometimes approached by a large, overly-friendly eel. One day the eel transformed into a handsome youth, identified himself as Tuna, the God of eels, and the two became lovers. After some time, Tuna announced that, although he must leave forever, he would give ‘Ina a great gift. ‘Ina was probably pleased to hear that in the flood the next day Tuna would swim to her house; but she was probably upset to hear that she was to chop off his head and bury it in her garden. The next day it rained and flooded and Tuna swam to her house, and ‘Ina cut off his head and buried it in her garden. After many days two plants grew, and after a few years they developed fruit. These were the first Coconut Palms, and they provided important food for her people. To remind us of Tuna’s great sacrifice every coconut shell has the two eyes and mouth of Tuna’s face on the end, and the white meat was often called "te roro o Tuna" (literally, the brains of Tuna). The original article followed the erroneous conclusions of Allen (1965), that coconuts were not pre-Spanish in the Americas. This article has been undated in line with the conclusions of Zizumbo-Villarreal and Quero (1998). 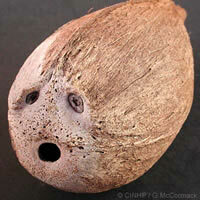 McCormack, Gerald (2005) The Origin of the Coconut Palm. Cook Islands Natural Heritage Trust, Rarotonga. Online at http://cookislands.bishopmuseum.org.